If you like your Westerns with a heap of parmesan on top or have watched all of the Clint Eastwood-Sergio Leone films to the point of tears, you’ll probably love Django. The acting by Franco Nero in the eponymous role is what you’d expect from the genre, but certainly no worse. This film was directed by another Sergio, this time Sergio Corbucci, who seems to love a violent scene far more than Sergio Leone ever did. It lacks the cool and retroactively hip music of some of the more mainstream spaghetti Westerns, but the camp-pretending -to-be-serious factor is intact. The plot is pretty standard fare. Django is a gunslinging widower who wanders the countryside with a gatlin gun ina casket. His mission is to find The Really Bad Bad Guy who killed his wife. He comes upon TRBBG with yet another female victim and spirits her away after the requisite flying bullets. Our hero then pairs up with The Mostly Bad Bad Guy to steal TRBBG’s gold and then of course kill him. The real pull here is Franco Nero, who can be thanked for paving the way for Terence Hill. Oh, and the Western-on-steroids level of violence. You also probably also won’t find a gunfighter without hands anywhere else. This movie was released in 1966, at the height of the Eastwood-Leone era, but was promptly blasted by the UK ratings system for its high level of graphic violence. In fact, it didn’t receive its certificate (parental rating) until 1993. 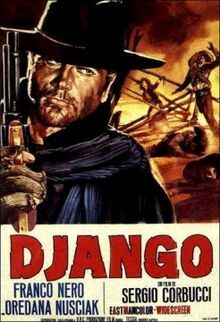 In 1966, some considered Django the most violent film ever made. To be fair, Jersey Shore wasn’t on TV yet. Django: You can clean up the mess, but don’t touch my coffin. Nataniele: If you’re a coffin maker, you sure did pick a good town to settle. For the purist, a bottle of cheap Italian red and a plate of cannolis are de riguer. If you can’t manage that, at least have the garlic flavored potato chips. And leave your mental clarity at the door; nobody cares if the gatlin gun isn’t realistically designed. If you’re The Good Guy, you need not fear recoil from firing a gatlin on full automatic. If you’re merely The Mostly Good Guy, YMMV. The hero of a spaghetti western may be brutal and hellbent on revenge, but he always has time for romance. 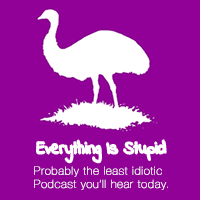 If you love the genre, it’s a good way to spend a couple of hours. On the other hand, if Lonsesome Dove is your favorite Western, you might be better off looking elsewhere.